Janie - I love the red! It make it all pop. 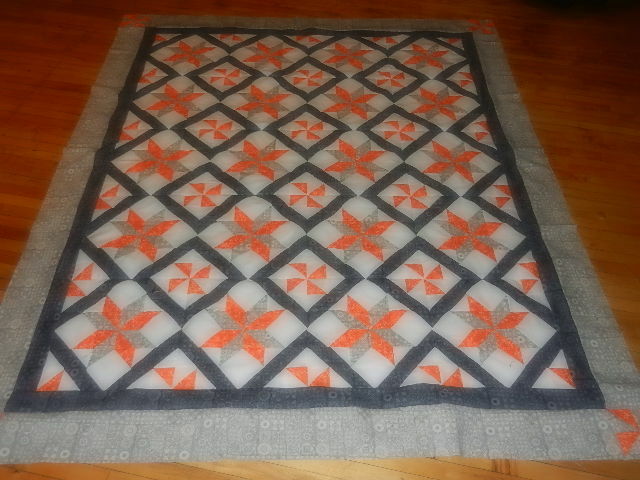 I am thinking of doing a pieced border using neutrals and colors for scrappy stars. I didn't mean to have my stars in a color family - it just worked out that I had enough because of the scraps I used for it. 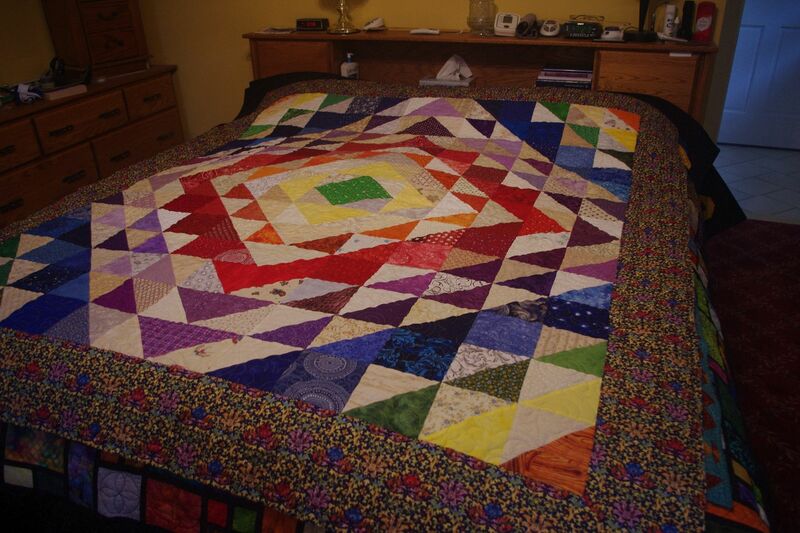 This is the quilt that generated the scraps. I did not repeat any fabrics, so I had a lot of triangles left over. I think the coral best also JanieW. I've just finished mystery #20 and really like this pattern, but as you can see I still am having trouble with wavy borders and not sure of what the cause would be....I measure 3 places and pin in several places. Perhaps I am stretching my tape measure or something. Anyway, here are pictures of both #19 that was recently finished and #20. In the end, they were both quilted with diagonal lines and will be Christmas presents. This is the best part....seeing all the finishes and the variations. 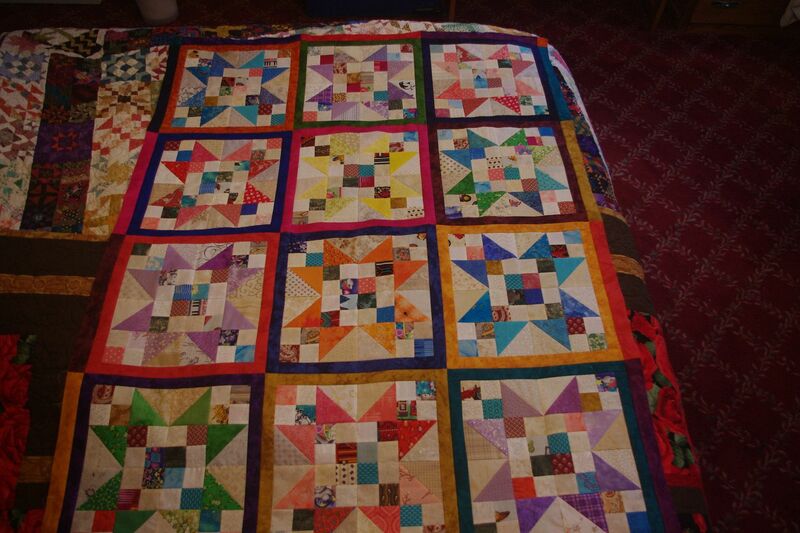 There are so many beautiful colors and quilts. Janie, I like the green sashes best, but both look great. Love the larger size Carol in WI, I may have to add a few. 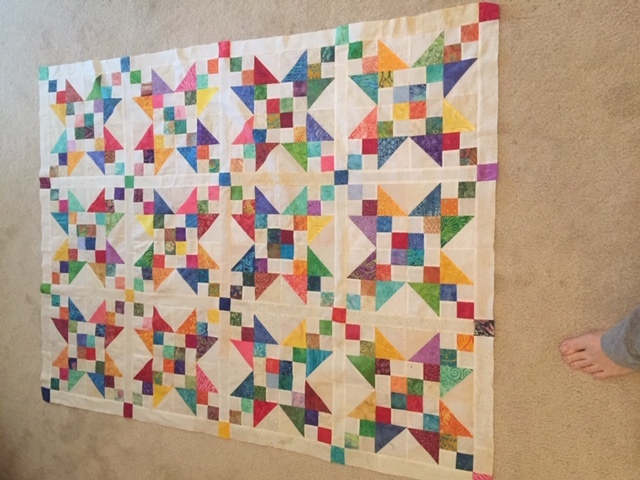 Here is mine so far, I used neutral sashing and bright cornerstones. To increase the size, I may do a scrappy 2 inch border then a checkerboard pattern all the way around in 2 inch squares. Keeping it all on the 2 scale. Toverly I love all the patterns you created by using neutral sashing and bright cornerstones. Janie did you try black or dark gray sashing? But if it is between the two you posted, I vote green. But maybe a darker green? Wow, you guys...what beautiful results everyone has shown. I did mine with yardage instead of scrappy and it doesn't look great because of the fabrics I chose. You could say my Mystery Train Ride "jumped the tracks". I'm going to save it, but I don't think it will ever look anything like the beautiful design Judy set us out to make. Oh, well...it's a mystery, right? Ditto what Watson said. Mine looks washed out. I'm so disappointed with my fabric choices! More beautiful blocks and tops. I have about 1/2 of the blocks made. I think my sewing mojo is coming back. .
Craftyjulz: Sending a prayer your way. Last edited by retiredteacher09; 11-06-2018 at 07:39 AM. I love your layout and controlled colour stars. It looks really classy. Just curious -- is the triangle quilt Aloho ripple by Andrea Smith? I'm still working on mine. 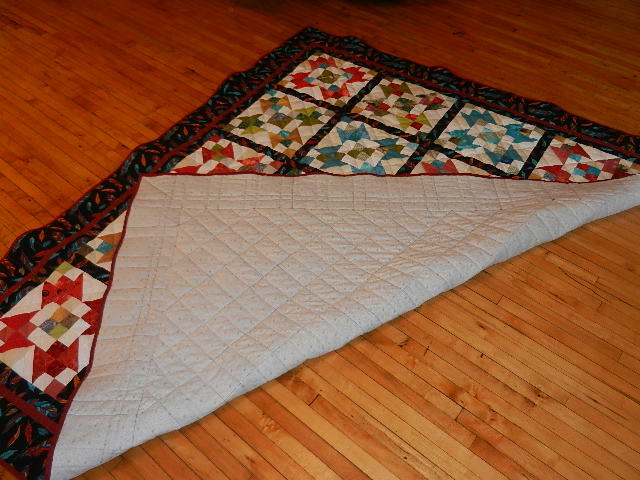 Janie, it does look neat without sashing - and does give some nice negative space for neat quilting. I have my blocks sashed and together. I really want to put a border on it, but have no idea what . . .
Last edited by Belfrybat; 11-06-2018 at 08:13 AM. I'm loving what I'm seeing! Julz- hope you feel better soon. Carol and Toverly -- fantastic finishes. Some people seem to have an innate sense of colour, even on scrappies. Both of you are in that category. your quilts are gorgeous ! I love how bright and cheery they all are. Great fabric choices. I’m still on the fence for my sashing. I’m not in love with either of my choices. I’m suffering from analysis paralysis. Judy, my husband suggested navy as the background in the floral is navy. The problem is I don’t have navy and I’m on a self imposed moratorium! My enabler husband is trying to get me to fall off the wagon. I tried the tone on tone white after seeing Toverly’s but it didn’t look as good as hers. Something will strike me, I’m sure. Last edited by JanieW; 11-06-2018 at 07:02 PM. Janie, your quilt is beautiful and I have to say that I vote with your husband - navy would look great. Count it as an early Christmas present to yourself . Janie, if your husband says you need to buy more fabric I say you should "obey" him! JanieW, I like a previous suggestion to quilt in the "white square" and I also like your husband's suggestion of navy shashing. Take some of the blocks to your LQS and lay them on navy fabric. Not sure what I would do if it were my quilt. Whatever your decision it will be beautiful. 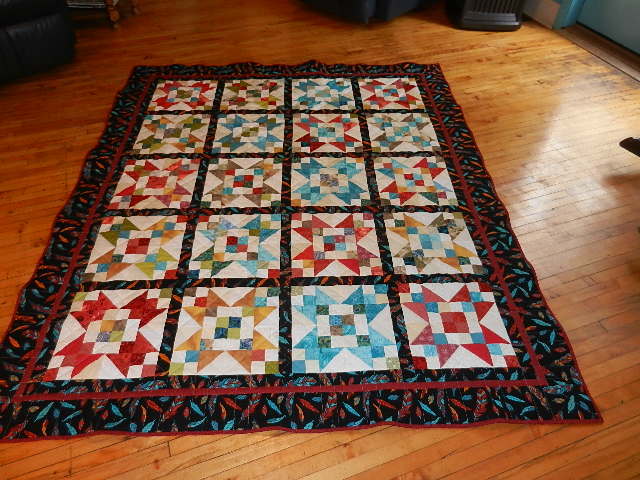 Hope you post a photo of your completed quilt. My quilt shop has a small shelf of candy so we have "groceries" when we come home. Good one Judy. The thing is to let them think they are boss,not let them be boss. After 42 years I learned a few things to. I did get 5 blocks done today and had to make more 4 patches as I decided to make it bigger than a baby size. I really like this pattern. Toverly--love the neutral sashing....I really like how everyones finishes are slightly different....Here is my finished one...since I was going scrappy...I even did scrappy binding!! RJ that's so pretty. Turned out great. I love the fall colors too. Thanks RJ, love the colors in your quilt too. That's fabulous, RJ! And even quilted and bound. Super. Congratulations, RJ! It's very pretty.